Google rolled out an update today for their ebook app for Android and it looks to be a good one. In addition to the performance enhancements and numerous bug fixes, Google has also added several serious feature updates and upgrades. The zoom features should now be working in all ebooks, both pinch and double-tap; it appears to only be good for enlarging images, not the text. 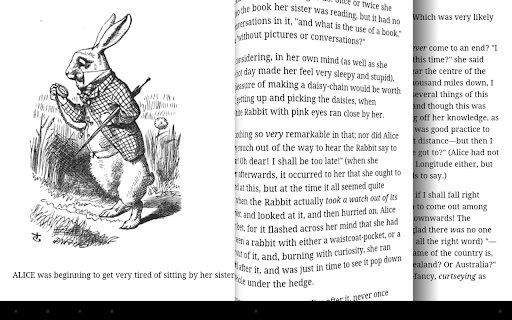 The "Read aloud" feature is now working in most ebooks, though performance is still dependent on the version of Android which you are running. My older original Galaxy Tab has a terrible voice, but then again it is only running Android 2.3 Gingerbread. The update notes also promise that all text editing features are available for notes, and on my Galaxy Tab that includes highlights in 4 colors, typed notes, and bookmarks. Looks good – but it’s still unavailable in most of the world. I really wish google would get their act together and consider the world as a whole their marketplace. I’m in Switzerland, and none of the current ‘nexus’ devices are available for purchase. (I had to pay an arm and a leg for a grey-import Nexus-7). Amazon are actually better, in that even if all their devices aren’t sold here yet, it’s still possible to purchase content through the US store. (And the same goes for Apple – before the launch of the iPad overseas, it was still possible to use the US appstore.) – Admiddedly both the Amazon and Apple offerings are less impressive than what US customers get, but at least there’s something. Sure, there are IP issues, but if both Amazon and Apple can handle it I see no reason for Google to drag their feet. I can zoom in on the text as well, but the text does not reflow. However, I thought many google books are scans of text without OCR applied, so are technically images, no? However, read outloud feature would not work if they are images I presume, so maybe I am wrong. Really? Maybe it’s just my old version of Android getting in the way. Something tells me the text in this book may be a scanned, so it is treating it like an image. Text zooms with either ‘flowing text’ (‘epub’) or ‘original pages’ (‘pdf’). If the title has both options, you can select which from the settings menu. Reading position is maintained when you switch between them. This is a feature I’ve always liked about the Play Books app, and it is unique. Other vendors offer multiple formats, but not integrated in this fashion. A big improvement. But only in the sense that it catches up.